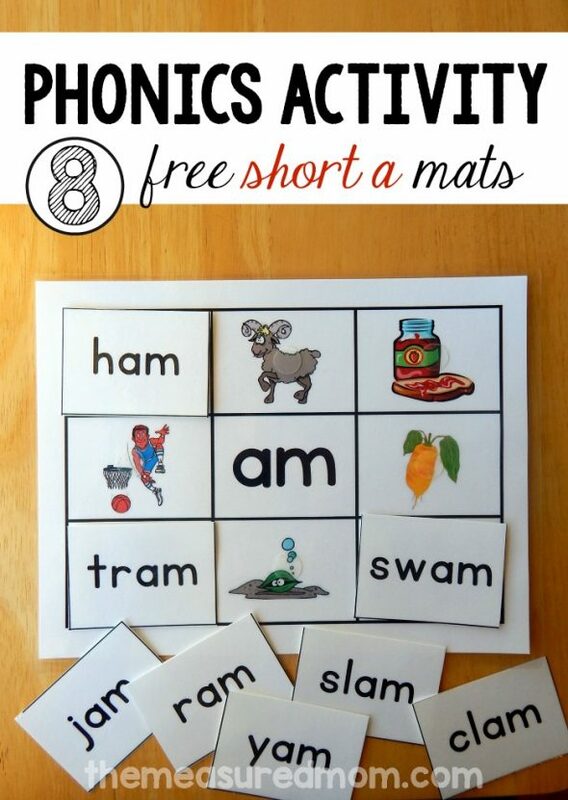 8 Short a Word Family Mats – printable! One of my favorite things to do as a mom is teach my kids to read. We start by reading tons of books together, continue by learning letters and sounds, and then move to more directed learning when they show the interest and readiness. I’m not a big worksheet gal, so I love to find hands-on ways to practice. Since my 4 1/2 year old son is not a worksheet guy, what I’m sharing today works really well for him. I’m excited to share something I’ve been working on for some time — 8 short a word family mats! I call them “Read ‘n Stick” because my kiddo reads the word cards and sticks them to the pictures using velcro dots. Word families are groups of words that share the same ending. For example, the words cat, fat, and mat all belong to the “-at” word family. Why teach reading with word families? 1) The English language is complicated. A bit daunting for someone just learning, wouldn’t you say? Word families help beginning readers find predictable patterns within words. Instead of reading /k/ /a/ /t/, the child learns to read /k/ /at/. Why use Read ‘n Stick Mats? 1) They’re hands-on. My son enjoys reading the words and sticking them to the pictures. Flash cards? Not so much. 3) They’re vocabulary builders. I’d love to make all eight words familiar ones – like crab and cab. But there aren’t enough of them! The bonus if that your child’s vocabulary expands when you teach him words like slab and gab. Who should use these mats? a) They easily know all their letters and sounds. b) They are beginning to show the ability to blend sounds together. c) They have an interest in words and reading. 2) They are for kids who struggle with the task of sounding out short words and need some word family practice. 1) Print and laminate each mat on sturdy cardstock. I love this affordable home laminator and laminating sheets! Then print and laminate each set of cards. Cut them apart and stick velcro dots to the pictures and backs of the cards. 2) You can certainly print the mats and cards on plain paper, and have your child match them. However, for a more durable and lasting activity, I recommend #1. A bonus of the velcro dots is that you can store the mats without the cards getting lost — just stick them on! 4) Take off all the cards. Have your child read the name of the family in the center of the board. Then have him read each card and match it to the picture. You will be teaching new vocabulary along the way when he gets stuck on a particular word (“What’s a stag?”). 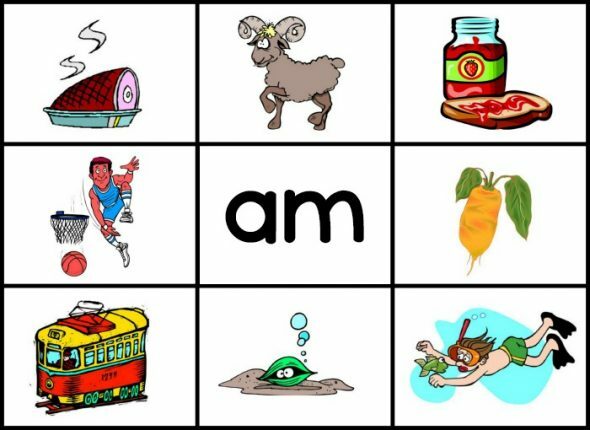 We highly recommend this reading curriculum for learning short vowel words – it’s fantastic! P.S. Want to know more about teaching kids to read? I created a free email series just for you! Anna, these look great! I have been looking for things for the kids to do when we drive to CA this summer. This will be a perfect activty for Joshua to do in the car. These are terrific! My daughter is eager to “learn words” as she says, and I think she would really enjoy these mats. Thank you, Shaunna! I subscribed to your blog by e-mail recently and have really enjoyed your content! These will really come in handy. Thanks for sharing. Just pinned! Thank, you Vicky! I hope your girls enjoy them. Thank you for the link to your linky part, Beth! I hope to be there weekly. Thanks so much for sharing. These are great. Thank you, Niki! I hope they prove useful for you! LOVE these! Thank you so much! 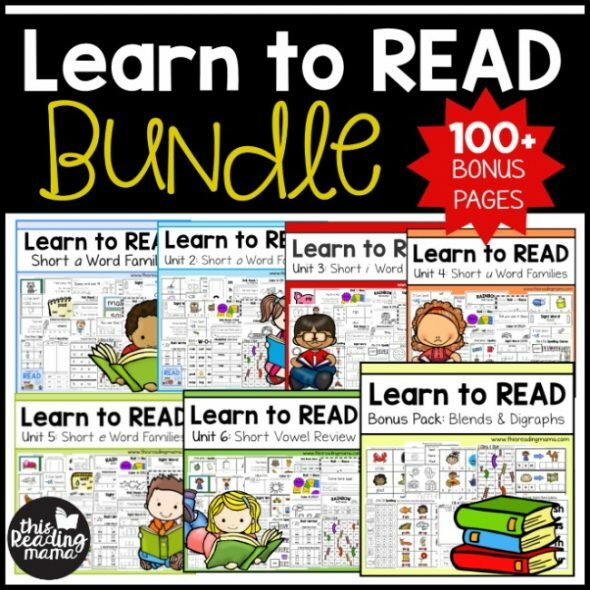 I have recently been noticing the lack of actual simple reading games for purchase that I can recommend to parents of early readers and these are perfect…not to mention free. Thank you!! This is great…your posts are very valuable. I am pinning this to my Look What We Did – Phonics board. Thank you, Savannah! I hope a lot of kids can use them. These are wonderful! 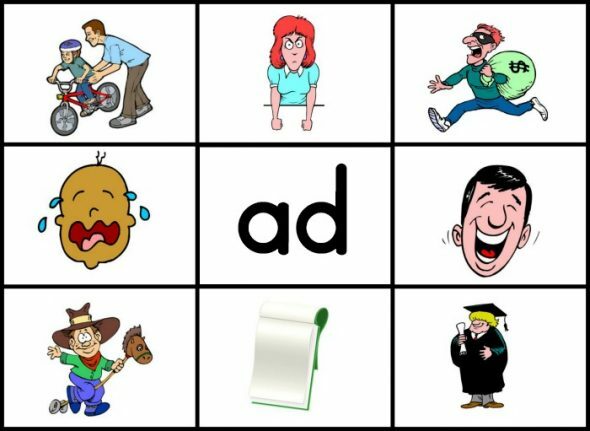 I can use these with my intervention groups to help them with word families. Thanks so much for sharing!! Thank you, Andrea – I’m so glad other kids will benefit from them! Awesome resource! Thanks for sharing, I will be using these with my little guys. So glad you like them, Becky Marie! Thanks for visiting! Thank you, Sarah! I popped over to your blog. I don’t know much about Montessori but hope to learn more — I subscribed to your blog by e-mail. Thank you for sharing your great word mats. You are so generous to share all of those! You’re welcome, Amy – I hope they work well for you! These are soooo clever!!! 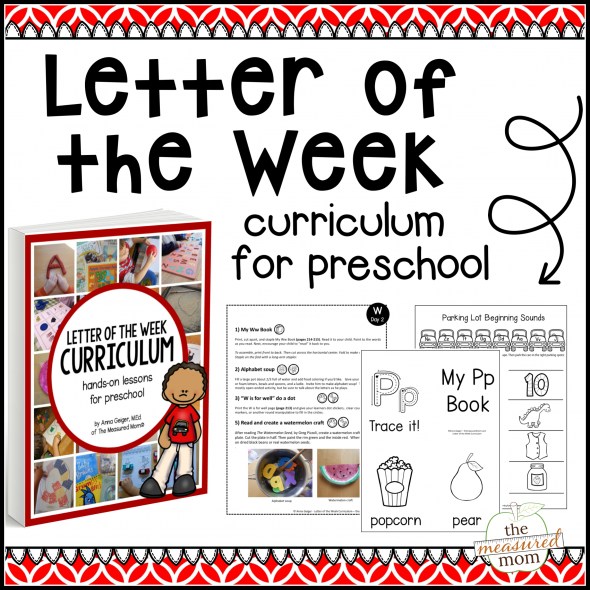 I am a kindergarten teacher and this will be perfect to help my little ones who are struggling! I will share with the rest of my team!!! Thank you so very much for sharing this great idea!!!!!! Yay, I’m so glad when teachers find my stuff. 🙂 Thanks so much for sharing it, Ellen! I’m right there with you, Sarah — my 4 1/2 year is a BUNDLE of energy and has been since the very beginning! It takes some time to assemble these, but I think it’s worth it. What a great idea. You have made excellent fun cards and a way for hands-on learning. This looks wonderful. Thank you for sharing. I will be using these soon with my six year old to build more word families and vocab into his treasury of words he is confident in! I’m so glad you can use them, Jeniver! Thanks for stopping by, Rebecca! I really appreciate the pin. These are wonderful! DD loved learning with these. We used ab and an and I just printed off the rest. Thank you so much for offering these – they’re just what we needed! These mats are awesome just like all of your printables. As a mom with 3 active boys from 15 months to 6 with another on the way, it’s hard to find time to make up printables. That’s why I’m so grateful for amazing moms like you who can not only find the time to come up with all these wonderful ideas but offer them for free. You make me look like super mom to my boys’ speech therapist who marvels at your at handiwork and loves to incorporate your printables into their sessions. Thank you for all that you do!! Thanks for sharing these. I am a special education teacher and have little ones who are struggling readers. These are great activities and encourage the students to actually read in order to cover their match. This is a hands on activity that they love and I love too. Thanks so much for your comment, Janna! I love to hear that these are being used in school, especially for struggling readers! I just found these a few days ago, decided to print the -at family for my son (we recently finished the -at family, so great review). Well, he loved it so much he insisted I print them all! LOL He especially liked the blends, which I hadn’t started working on with him yet. Thanks so much for this! Your comment made my day, Kristine! Thanks so much for sharing! A good reminder to get working on those short i mats soon… on my to do list in the next month! Thank you SO much, Deb! I’ll also let you know that I’m featuring your “Grace and courtesy” post at the After School Linky on Monday. 🙂 And I’m working on the short i read ‘n stick mats for later this month! These are wonderful. I would absolutely buy access to large sets of these. Thank you for making them available. You should seriously think about selling these as pdf’s on Etsy or something. Thank you so much, Sarah! I actually couldn’t sell these because I used MS Office clip art. It would require purchasing clip art and recreating these in order to sell them. I hope to offer some sort of e-book for purchase in the future, but that will have to wait until I find myself a little less busy. Considering we’re expecting a baby in January, that will probably not be any time soon :). I hope you get a lot of use out of them! Love your word family mats! I am going to use them in my Daily 5 word work rotation in my kindergarten classroom! You have a wonderful website:) Thank you for all of your hard work! Somehow I missed your comment from way back in September – sorry about that, Carolee!! I am so happy to hear you are finding things on my website to use in your classroom. Love, love, love when teachers find me! I’ll be sharing short e read ‘n stick mats tomorrow and the final set before Christmas. Enjoy your December! Anna, what excellent ideas you have got and thanks a zillion for sharing them…I was groping for something like these and the family mats & cards is an amazing idea…My four yrs 9 months daughter is struggling with spellings and how to put together sounds to make words. Hi, Smita! I have found that my kids are able to start sounding out words somewhere around age 4, but every child is different. Working with word families has really helped. The word family houses are simpler and easier if you’d like to try something like that. You can find them on my Free Printables page. Thank you so much for these! My son is a visual learner, so they will be a great help. You’re very welcome, Yesenia! Enjoy! Thank you so much for all the wonderful printables! I’ve been using the word family mats with my kindergarten class. They are great for small group reading rotation! That’s great to hear, Janna! Thanks so much for commenting to let me know how you’re using them in your classroom. Love to hear it! Thanks so much. These are great to help my emerging readers. Just what I needed. You’re very welcome , Heather! Hi! I keep getting a message that the download page no longer exists. Is there another link I should try? those are great items!!! i downloaded them all~!!!! and add you in my bookmarks~!!!! thanks a lot! Great mats! Only point to make is that the font used for the “a” on the mat versus card was different and could confuse a toddler. Hmm, are you sure? I do think I used the same font. But if font style was confusing a child may not be old enough to use these. I wouldn’t use them with a toddler. Of all the free, printable, homeschooling resources I have seen on the web, I find yours the most helpful! Thank you for making them available. My 4 1/2 year old is learning SO much from your word mats, and I can’t wait to start using the beginning sounds mats with my almost 3 year old. (I’m trying to hold off until he is a little more ready, but hoping it will be soon.) I love how the word mats have very simple CVC words, as well as some with consonant blends and even a few with tricky silent letters. 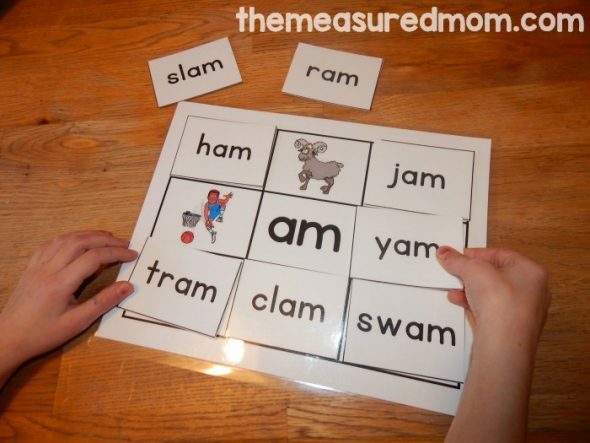 They are are great practice for a beginning reader and a great introduction to new rules. Thank you!!!! Thanks a bunch. Am enjoying it every bit and hope to use them with my kids. Thank you so much for these fabulous game mats. I’m a Dyslexia and Literacy specialist and games are always so much more effective for children with no literacy confidence. I’ve made a big collection of my own phonic games over the years and can’t overestimate their value. You’re very welcome, Jane! I’m so glad you can use these! Were can i buy the clear dot velcro? I have looked around on Amazon, a link to the ones you recommend might be helpful. I just found you and your website today whilst searching for word family printables. I am trying to work on this with my 6 yr old who is on the spectrum but is really trying his best to blend and having a little trouble. BUT he tries and I am thankful for having found your resources. I have a few Questions first is that : do you have printables for ax,all, and, ask word families? Maybe I missed them. and secondly to have the same type of images for the other word families, do I need to purchase the printables pack or have I missed those too? hey there! I absolutely love these! we’ll be driving about 14 hours to the gulf in a couple weeks and I want to get these ready for then! This is Kate, Anna’s assistant. After you enter your email address, the file should be sent to you immediately. I just tested it to make sure it works. 🙂 You’ll open the email and click on a blue link that says, “CLAIM YOUR OFFER.” If you can’t find the email right away, please be sure to check your spam/junk and promotions folders. Thanks for giving it another try!